Barnsley moved to within two points of League One leaders Luton Town with a dominant victory at Southend United, despite playing almost an hour with 10 men. The visitors scored three times in the second half - Cameron McGeehan squeezing in a low shot, Cauley Woodrow slotting into the bottom corner and Jordan Green tapping into an empty net to stretch the Tykes' unbeaten league run to 15 matches. 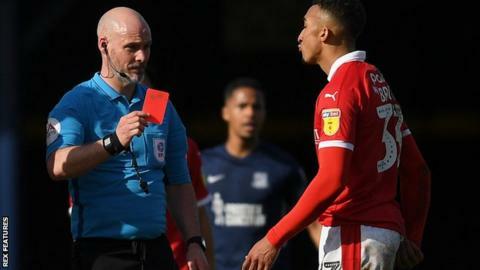 Jacob Brown was given a straight red card for a knee-high tackle on Sam Mantom before the break, just hours after winning the EFL's Young Player of the Month for January. But Barnsley were good value for their win, with Alex Mowatt and Mamadou Thiam also sending efforts just off target, as the hosts struggled to create clear-cut chances. Teenage substitute Charlie Kelman came close to equalising in the second half but failed to bring the ball under control just a couple of yards out and Barnsley goalkeeper Adam Davies clawed it away. Daniel Stendel's side, who are bidding to return to the Championship at the first time of asking, have not lost in the league since 8 December and are five points clear of third-placed Sunderland. The Black Cats have two games in hand in what now looks to be a three-horse automatic promotion race along with Luton following Portsmouth's demise in form. For an out-of-sorts Southend it was a seventh game without a win and 18th loss of the season - only bottom two Bradford and AFC Wimbledon have more defeats. Despite being 13th in the table, Chris Powell's Shrimpers are just seven points above the relegation zone and have played at least a game more than many other sides around them. Match ends, Southend United 0, Barnsley 3. Second Half ends, Southend United 0, Barnsley 3. Goal! Southend United 0, Barnsley 3. Jordan Green (Barnsley) right footed shot from the centre of the box to the centre of the goal. Attempt saved. Mike-Steven Bähre (Barnsley) right footed shot from the centre of the box is saved in the centre of the goal. Attempt saved. Simon Cox (Southend United) right footed shot from the centre of the box is saved in the bottom left corner. Corner, Southend United. Conceded by Adam Davies. Corner, Southend United. Conceded by Dimitri Kevin Cavaré. Attempt missed. Jordan Green (Barnsley) right footed shot from a difficult angle on the right is close, but misses to the right. Substitution, Barnsley. Adam Jackson replaces Cauley Woodrow. Corner, Southend United. Conceded by Ethan Pinnock. Substitution, Southend United. Dru Yearwood replaces Stephen McLaughlin. Attempt missed. Alex Mowatt (Barnsley) left footed shot from outside the box is high and wide to the right following a set piece situation. Alex Mowatt (Barnsley) wins a free kick in the defensive half. Attempt saved. Charlie Kelman (Southend United) left footed shot from the centre of the box is saved in the bottom left corner. Jordan Green (Barnsley) wins a free kick in the defensive half. Jordan Green (Barnsley) wins a free kick on the right wing. Corner, Southend United. Conceded by Cameron McGeehan. Corner, Southend United. Conceded by Jordan Green. Attempt blocked. Stephen McLaughlin (Southend United) left footed shot from the left side of the box is blocked. Substitution, Barnsley. Jordan Green replaces Kenneth Dougall. Elvis Bwomono (Southend United) wins a free kick on the right wing. Goal! Southend United 0, Barnsley 2. Cauley Woodrow (Barnsley) right footed shot from the centre of the box to the bottom left corner. Assisted by Mike-Steven Bähre. Foul by Charlie Kelman (Southend United). Foul by Alex Mowatt (Barnsley). Foul by Michael Klass (Southend United). Corner, Barnsley. Conceded by Stephen McLaughlin. Kenneth Dougall (Barnsley) wins a free kick in the defensive half. Substitution, Barnsley. Mike-Steven Bähre replaces Mamadou Thiam. Michael Klass (Southend United) wins a free kick in the defensive half.